When you look in a mirror, who do you see? Not the person other people see, since our reflection in the mirror is reversed - raise your left hand, and the person in the mirror raises their right hand! From the way we part our hair to the way we smile, our faces are not symmetrical. And the image we see looking at us from the mirror is not the face we show to the world - left and right are reversed. Step forward the True Mirror, which enables us to see ourselves as others see us! First patented in 1887, the True Mirror uses a combination of two mirrors, placed at right angles. In order to avoid an obvious line down the middle, the True Mirror uses front silvered mirrors, which have been made to fit together very precisely. There is a small adjustment button at the side, which you can turn to make sure the mirrors are perfectly aligned, and the join down the middle is all but invisible. Seeing ourselves as others see us is unusual enough. 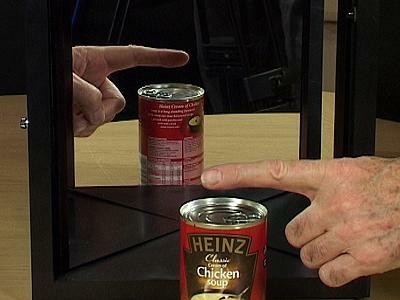 Hold up a piece of writing to the mirror, and you can still read it - it is not reversed. Hold your left hand up to the mirror and you see in the reflection a left hand, not a right hand as you would see in a normal mirror. If you look in the mirror and lean to your left, the reflected person leans to their left, i.e. the other way! If you rotate the mirror by 90 degrees, you will now see yourself upside down...People have different reactions to seeing themselves for the first time in a True Mirror. Some prefer the image they see, others do not. Some find it quite disconcerting. Either way, an interesting experience!The True Mirror can be wall hung. Wonderful and quirky, my favourite purchase of the year! Really great - such a talking point! Thank you. It is one of the unique products that I had bought throughout the my life time. The effect is very special, but the price also. The mirror is a Christmas present, I didn't get a chance to play with it.